You will have your own secretary after the update. The new secretary system can help you collect tax automatically when the collect CD is ready. After the chance is used up, the collecting will stop automatically. The secretary also can help you learning at school, the cool down time is 2 minutes and the learning is repeated every two minutes till the learning times of the Hero reaches the upper limit. Also you can use your Inspiration automatically by using this system, . When the Inspiration has been used up or the Hero has finished the training, the Inspiration will not be used. You can hide some notice by using this system. When the players from garden have some specific heroes who own the brotherhood abilities, and these heroes in the same battlefield ,they will have a chance to launch their brotherhood abilities. For example , Player A have heroes Lu Bu, Xiahou Dun Player B have heroes Diao Chan, Xiahou Yuan, and player A and player B in a same Garden, then player B’s Diao Chan will launch Reinforce and player A’s Xiahou Dun will launch Horseman’s attack in a same battlefield. There will be no the identity of teacher again in the school, players can learning and review by themselves without teacher. And the important to note, you can only use Study and Review after more than 5 people in your school, and you can get more benefit from the school after the update. a. You can get a certain amount of activities by performing some action in the game, you can claim reward by using these activities every day, these activities will be reset everyday. b. Players can exchange reward by using Weekly Activities which is accumulated day by day. 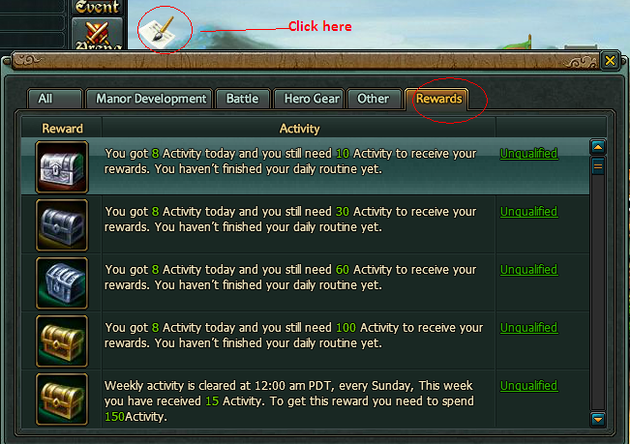 The Weekly Activities will be cost after you claim the reward, each reward only can be claimed for once everyweek. You will find these abilities after the update of the new version. The CD time of Buy a Round and Tip the owner reduce from 3 minutes to 10 seconds. After the update, You can use the medicine items to immediately improve your Hero Stats. But because the Vitality is different for heroes, so there is a limit that you can increase the stats of your heroes by using items, Enhancing Vitality can increase the limit of stats you receive from medicine. Snake Oil: Permanently increases Hero's Power by one point upon use. Invigorator Pill: Permanently increases Hero's Leadership by one point upon use. Luminous Pill: Permanently increases Hero's Intellect by one point upon use. Heart Pill: Permanently increases Hero's Politics by one point upon use. c.	After update, you can get the reward at 23:55 every day after one challenge in the Last Man Standing instead of 5 challenge per day. 8. You can get the 12th, 13th ,14th ,15th 16th retinue for free after update. 9. The attack and dense of NPC have been adjusted.